This is part two of a three part series to get my blog up to date on my ejector research. Part I was about ejector theory: Ejectors in Refrigeration – an Expressor. Part III is about assembling and testing: Ejector Assembly Construction. Within two weeks of studying refrigerant ejectors, I decided I might as well try my hand at building one. Well, let me say, I thought refrigeration itself was an obscure hobby, that is until I tried to find ANYONE who has worked with ejectors, outside of universities and industry. What I had to go off of, is some passages in antiquarian books on steam ejectors, a handful of digital papers in the research category, and a number of patents. Have I mentioned how much I LOVE Google Patent Search?! As my machining skills are essentially non-existent, and my material of choice is copper, that seemed likely as my ejector material. Some ejectors are made by metal spinning and welding, some are machined, and some are cast. Copper spinning is something I would love to get into, and I believe a fantastically useful skill to have, however it would require a lathe (which I do not have), as well as a machined form (refer to previous parentheses). 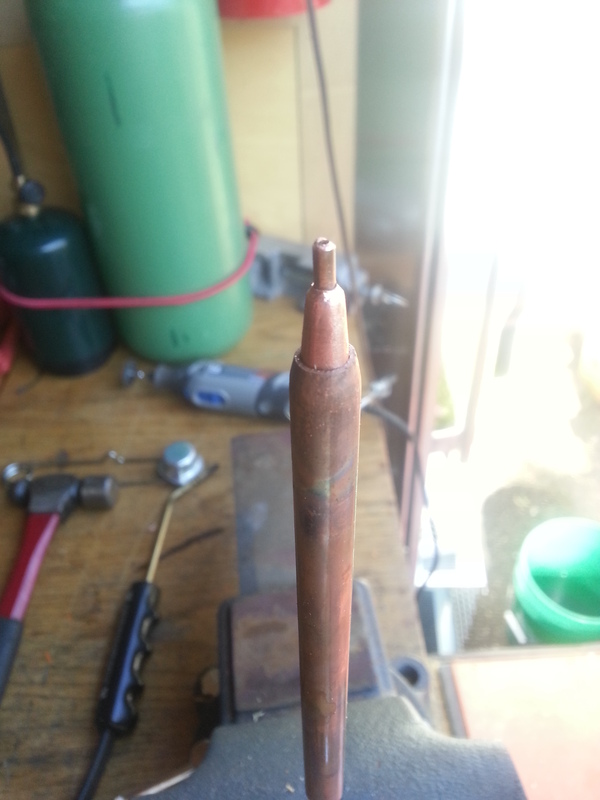 I’ve tried widening a piece of copper tubing, such as by driving a tapered mandrel into some annealed 3/8″ tubing. It is quite difficult to do. I’ve tried spinning the tubing onto the mandrel with great force. 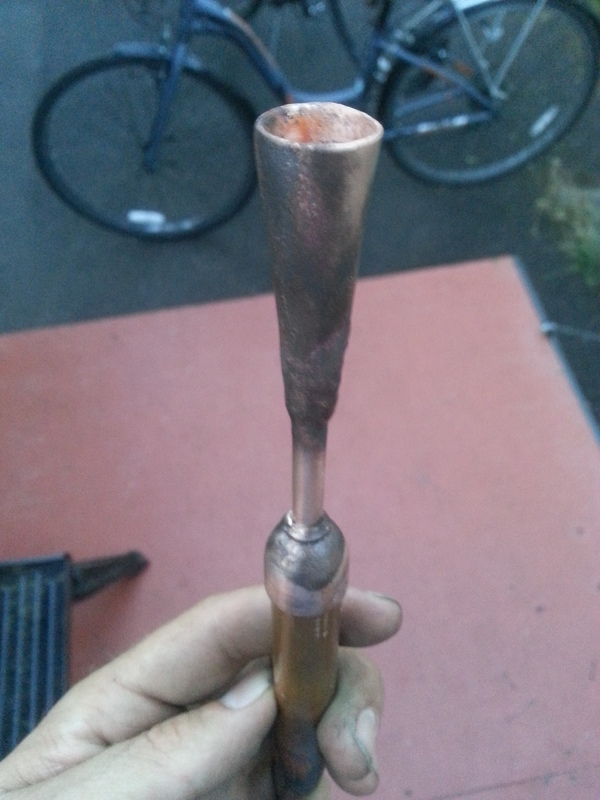 The mandrel was too big for the drill chuck, so I had to mash the copper in it. 😉 Doesn’t matter – didn’t work well. I thought I had found a route to success when I stretched a piece of 1/2″ hard drawn copper pipe with a hydraulic “Port-O-Power”. As it pulled, I would heat the center with a torch. It worked for a while, but then the copper got too thin and broke. Raspberries. Have to say, I was pretty pleased with it. Copper is an amazing substance. 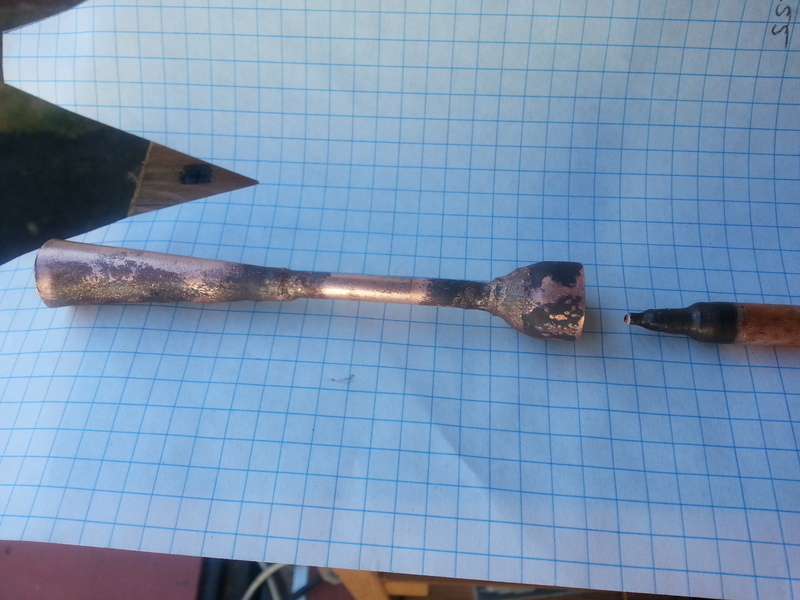 By holding the pipe over the head of a hammer (I used a large ball peen), and tapping on the copper in one spot with a round club (I used a thick brass punch), while rolling the pipe between blows to keep it even, I was able to make this in about an hour. Although Graham never mentions it, I found that after 30 or 40 blows, the copper gets work hardened, and difficult to mold. I simply heat the piece up to annealing temperature with an oxy-fuel torch, and drop it in a bucket of water to cool. 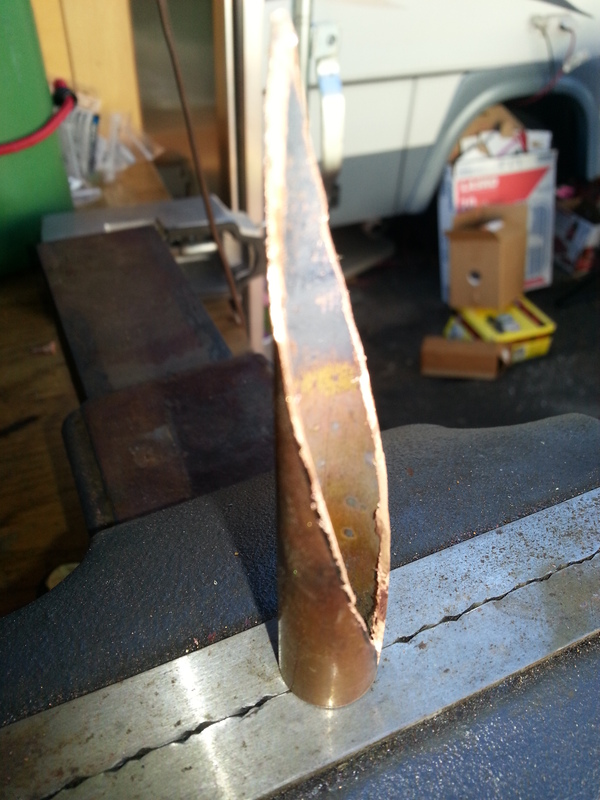 After annealing, the copper is once again very soft, until several blows later it needs annealed once again. The second attempt started with a desire to produce a specific angle for the convergent and divergent cones. I searched through all the tapered punches I had, and found one close to the desired angle. I got a little excited with my bashing and smacked it toward the right side (as viewed in the above picture), resulting in some lumpiness when I returned to the throat and worked my way right. The sharp angle on the convergent nozzle was partly eye-balled, then finished by inserting a 1/2′ bolt I cut off short and ground to a point. Afterwords, I inserted a straight punch in the throat and bashed the copper until the throat was round on the inside. Overall, this was an improvement, but not yet good enough. 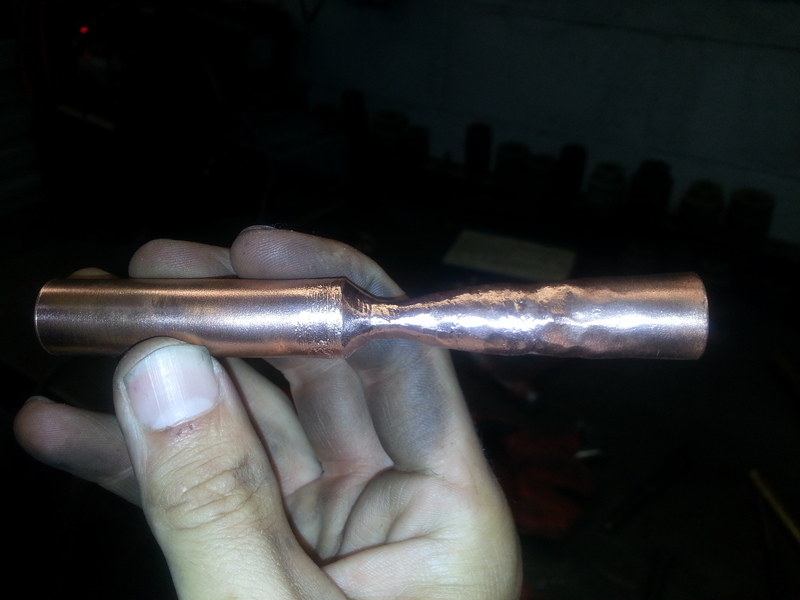 A problem with this method (for my purposes), is that creating a long mixing section at the throat was going to be difficult without just cutting it and brazing either end to some copper tubing. Another con for the “bash it till it’s pretty” method, is that the interior surface is somewhat rough, and that ain’t gonna do – no sir. Out of focus, but I think you get the idea. I’m making my own copper cones. By calculating the final outside dimensions and cutting a paper triangle equal to the surface area, I was able to trace it onto the face of a piece of copper and cut it out with the Dremel. Cleaned up a little and folded over. Not remarkably straight, but you got to start somewhere, eh? 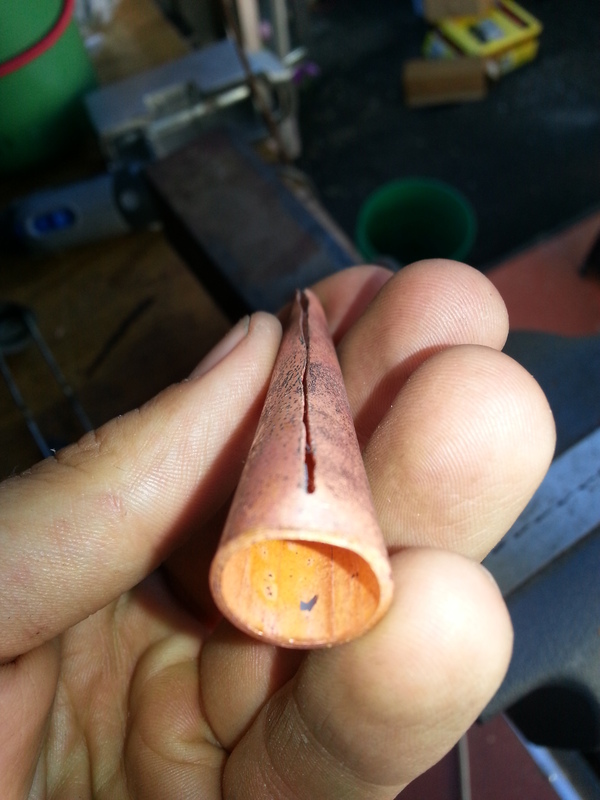 Folding the copper is really easy, unless you don’t anneal it first. After annealing and cooling, I put on some leather gloves and just squeeze the seam shut by hand. The last little bit is pulled together by clamping a tapered punch in the vice, then by holding the cone over the punch with one hand, carefully smack the copper with a rubber mallet using side-to-side glancing blows, to minimize the seam and make brazing easier. Also, cut as much of the narrow end off as you can before folding. This makes the operation much easier. I braze the seam shut, then cut and grind the ends square. 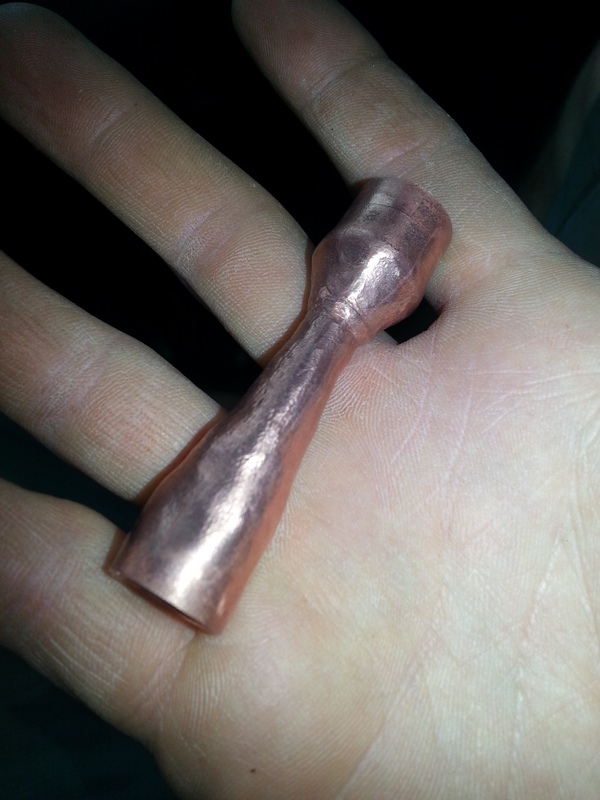 The convergent nozzle is made by annealing a standard copper cap, then setting it in a 9/16″ inch hole cut into a pine board. A pointed punch is driven into the cap with a few swift blows from a hammer. A small hole is drilled, then a narrow tapered punch is driven into the hole, widening and slightly flaring it to create a smoother transition into the throat. 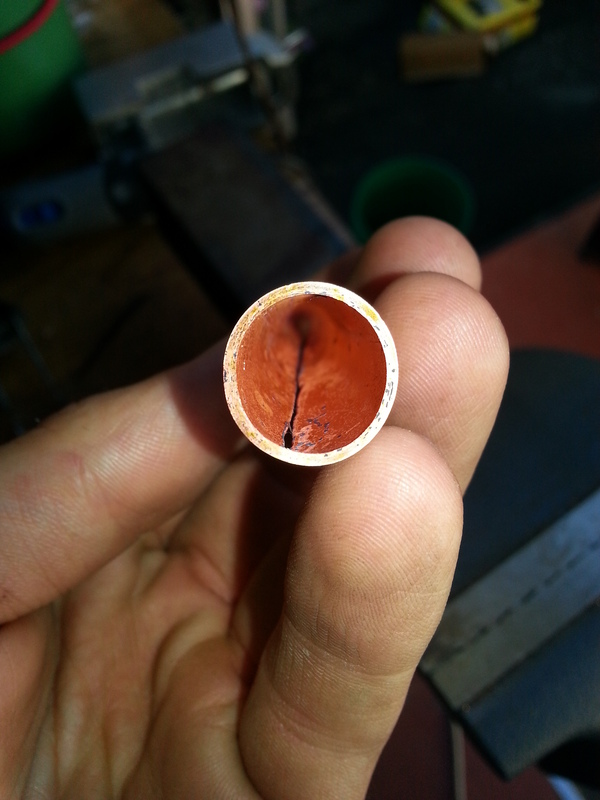 A short length of 1/4″ tubing was cut and flared on one end, to be brazed to the convergent nozzle. The divergent nozzle is drilled out to except the tubing, in order to smooth the transition. I am much happier with this style of manufacture since I can more easily control the angles and overall dimensions. I chose to make at least one more ejector before proceeding to the next step. This model was made very similarly to the last, but with a slightly more tapered divergent cone, and a longer mixing throat. I have found a lengthy soaking in white distilled vinegar to remove much of this black oxidation you see, but did not do it on this one. The object to the right which looks like a writing utensil is the primary motive nozzle. It was constructed by brazing a one cm length of capillary tubing (I don’t know what size – all guesswork here! 🙂 ) into a length of 1/4″ tubing , brazed into a length of 3/8″ tubing. The ends of the two sizes of tubing were hammered to reduce them. The 1/4″ tubing will carry the high side liquid to the orifice. The 3/8″ tubing is slightly shorter, and its only purpose is to reduce the volume of the annulus, when fitted inside the section of 1/2″ pipe which will lead up to the venturi. I believe this annulus should be designed with a small cross sectional area in order to keep the velocity of the evaporator vapor high as it approaches the convergent nozzle. AC_Hacker here. I happen to have a small metal lathe and a small milling machine that could be useful to you. I live aprox 15 miles away. You should get in touch. Sounds great! I’ll shoot you a message on Ecorenovator. Facts and opinions are easy to mix up, eh? Haha. I’m seeing a great number of apartment buildings being heated and cooled by mini split heat pumps. Dozens of these air-to-air units are installed on roof tops, or in parking garages. Each apartment has independent control, and an independent electric bill. When I asked a technician at one of these sites, why they don’t utilize centralized systems, he told me that it could never achieve the efficiency of these mini-splits. I was not satisfied with his response; somehow seems wrong. What is the cost of the individual unit? Long term replacement costs? Servicing / maintenance costs? Environmental cost of manufacturing forty two compressors? Is the technology or refrigerant even supported in 10 years? This culture is very short sighted sometimes. You might be interested to know that there are some solar thermal ejector systems out there which utilize solar thermal to heat a boiler with the working fluid refrigerant. The pressure created is passed through an ejector and on to a condenser. The low pressure behind the ejector, can be used to lower the pressure on an evaporator coil, producing refrigeration or air conditioning. As a cooling system, the COPs are rather low, but sometimes worth the effort. As a heating system, COPs are generally above 1.0. The company “Denso” patented a system to utilize the waste heat of an internal combustion engine, to provide air conditioning to an automobile passenger compartment, by using an ejector. These types of systems are interesting, and I may work with them someday, but for now I will focus on the ejector as a means to conserve exergy in a conventional vapor compression system.